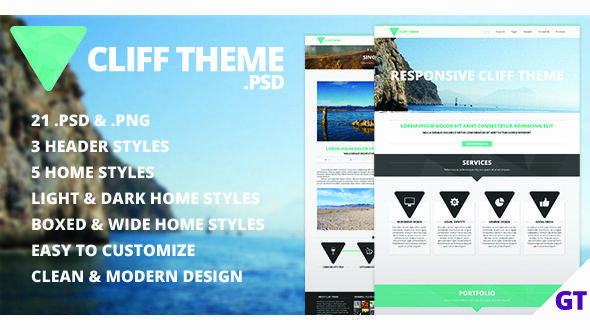 Cliff Theme is multi-purpose psd template. It can be used like corporate site and also site to present personal skills. It has a 3 header styles, 5 portfolio layout, multiple homepage options (light and dark version) and numerous other options included for services, team members, prices, process, pricing tables, testimonials and so much more. Check out the screenshots to see them all! We included 21 PSD files! NOTE: All images are included in the PSD files. Iphone, Ipad and browser mockup (9_services.psd) are not included! Were downloaded from pixeden.com.